Take a short tour of Fair Lawn NJ one of the many communities we appraise in New Jersey. Vintage post cards brought to you by Greetings From Bergen County. Take a short tour of Ridgewood NJ one of the many communities we appraise in New Jersey. We hope you enjoyed this presentation, come back soon and where else we may have visited. Mortgage lenders make many borrowers purchase mortgage insurance to protect the lender if the borrower is unable to pay the mortgage. In other words, mortgage insurance guarantees your lender will get paid if you default. For the borrower, it has a benefit, too: Getting mortgage insurance allows you to purchase a home before you have the full 20 percent down payment saved up. 1. What are the different types of mortgage insurance? In general, there are two types of mortgage insurance: mortgage insurance bought from the government, designed for those with FHA or VA loans or mortgage insurance for conventional loans which is bought from the private sector (this is called private mortgage insurance or PMI), Basically, the type of mortgage insurance required will depend on the type of mortgage loan you get. 2. Who is required to have mortgage insurance? Typically on a conventional loan, if your down payment is less than 20 percent of the value of the home, lenders will require you to carry mortgage insurance. Usually, you pay those mortgage insurance premiums until your loan-to-value ratio (LTV) -- this is simply the amount of money you borrowed divided by the value of the property you bought -- hits 80 percent. For example, let’s say you bought a $100,000 home and put down 10 percent, or $10,000, and got a $90,000 loan to pay the rest. Your LTV in this case would be $90,000 divided by $100,000, or 90 percent. The longer you pay down your mortgage, the lower your LTV will become. On government loans, mortgage insurance is normally required regardless of the LTV. 3. What does mortgage insurance cost? Conventional Mortgage insurance rates vary -- usually, the lower your down payment and/or the lower your credit score, the higher the premiums -- but typically the premiums can range from $30-70 per month for every $100,000 borrowed. So, if you bought a $300,000 home, you might pay about $150 per month for mortgage insurance. On FHA loans, there is an up-front MIP (mortgage insurance premium) and annual premium which is collected monthly. VA loans have an up-front fee(funding fee) and no annual or monthly premiums. Contact your lender for specific details. 4. What does mortgage insurance cost? Typically, you’ll pay your mortgage insurance premiums monthly right along with your mortgage payment (you can just send one payment to the lender). Lenders may also allow you to pay your PMI on a lump sum basis either in cash at closing or finance the premium in your loan amount. 5. Why do I need mortgage insurance? Your lender requires you to have mortgage insurance so that if you can no longer make payments on your home, the lender will still get paid (through the insurance policy). Mortgage insurance basically safeguards the lender in the event of borrower default. 6. How can I avoid paying mortgage insurance premiums? If you put down 20 percent or more when you buy a home, you can typically avoid paying mortgage insurance on a conventional loan. And once you've built up a certain amount of equity in your home, you can request to cancel it (see below). 7.When does mortgage insurance “fall off” the loan? Once the borrower has built up a certain amount of equity in the house, typically 20 percent, the mortgage insurance policy usually may be canceled. The lender usually won’t automatically cancel PMI until you've reached 22 percent equity based on the original appraised value of the home, but you can request cancelation at 20 percent of the current market value. So if you own a home worth $100,000 and have paid down $20,000 in principal, you can request to cancel your PMI. You've seen the commercials with aging Hollywood stars touting REVERSE MORTGAGES are the right for you? No monthly mortgage payments are due for as long as the homeowner lives in the home and meets eligibility requirements for maintenance and paying property taxes and insurance. What Is A Free Estimate Of Your Homes Value Worth? You get emails every so often telling you to find out what your home is worth for free with no obligation. What do you think this valuation is worth? Turns out not a hell of a lot. All sales are within the prior 6 months. In all cases relying on the free estimate would have cost the homeowner considerable money. If you need a valuation of your home, rely on the free site and you could lose money. Save money and time by having your home ready for the FHA appraisal. The deaqdline for appeal of municipal assessment for most Essex County home owners is April 1 2014. At Bogris Appraisal, we have prepared appraisals, and have testified before the Essex County Tax Board on many occassions, and have saved Essex County Homeowners thousands. If the Assessor says your comparable sale is not usable what do can do? Your appraiser knows how to overcome this stumbling block. 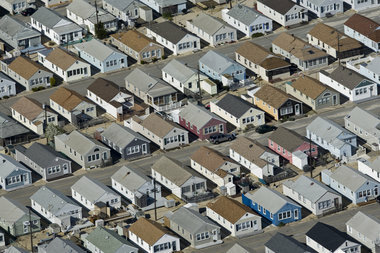 Andrew Mills/The Star-LedgerAerial view of the similar bungalow-style homes at the Midway Beach Condominium Association, a small beach community located south of Seaside Park. A small piece of tax code allows assessors to disqualify a property for comparison they believe was sold under financial duress. When homeowners go to fight their property assessment, the first thing they often do is examine the sales of similar homes around the neighborhood. It can be the key to a successful tax appeal. If your neighbors’ homes sold for tens or even hundreds of thousands of dollars less than your assessment, you’re likely to win your case. But as more homes are being sold at cut rates in a sour economy, towns are increasingly ruling those sales as invalid for comparison, making it tougher for homeowners to catch a break on their tax bill. The culprit is a small piece of the tax code that allows assessors to disqualify a property for comparison they believe was sold under financial duress. Last year, more than 11,000 properties were disqualified on these grounds. That’s good for nearly 11 percent of all properties that were disqualified, up from 8 percent in 2009. Homes sales are considered usable for comparison if an assessor believes it is indicative of fair market value. But home sales can be disqualified and deemed unusable for myriad of reasons, such as foreclosures, short sales, or when a homeowner is willing to accept nearly any price in order to move because of divorce or a death in the family. “Ultimately, our courts are going to have to look at that issue because at some point, if you have an overwhelming number of foreclosures in a particular area, doesn’t that make the market?,” said David Wolfe, a property tax lawyer in Livingston. The state Division of Taxation has caught wind of the issue, and is reversing some appeals after finding assessors who misunderstood or misused the law. When sales are improperly recorded, “we will change it”, said Thomas Reilly, chief of valuation and mapping for the office. “Ninety percent of assessors do the right thing, but sometimes there are gray areas. Assessors sometimes misclassify things,” Reilly said. Staff was added to the office in 2009 partly to address the issue and “educate” officials, he said. Though several attorneys and appraisers acknowledged the rise of the issue, they said it shouldn’t scare residents off from filing an appeal. Wolfe said the “undeniable truth” is that there are more distressed sales than there have ever been. But just because an assessor marks a sale as unusable does not mean that the county tax board or the tax court won’t necessarily consider it in an appeal, he said. Star-Ledger staff writer Eric Sagara and Dave Sheingold of The Record contributed to this report. Bergen County expects record number of tax appeals this year!! HACKENSACK - Robert Layton, county tax administrator, stated that he expects his office to process as many as 15,000 tax appeals this year, more than any other year in his 34-year career. Cash-strapped towns like Saddle Brook and Teaneck are planning are considering bonding more than $2 million apiece to pay for the refunds. Some towns are setting aside much more money-in Rutherford three times more-than last year for tax appeals. To help bring down the number appeals, the tax board has ordered Teaneck, Ramsey, Rutherford, Washington Township, Westwood, Wood-Ridge and Wyckoff to revalue in 2014. Don't miss out on this historic opportunity! HOW TO THAW A FROZEN CREDIT LINE!!!!! Your credit score just got whacked. A frozen HELOC doesn't always spell credit-score doom. Under some circumstances, freezing a HELOC might not change the score much; under others, the credit score can tumble enough to derail one's financial plans. Falling home values are prompting lenders to take new defensive steps to guard against loan defaults. They've started to freeze and cut back hundreds of thousands of home equity lines of credit. One of the U.S.'s largest mortgage lender, sent letters in January to 122,000 customers, telling them they can no longer borrow against their HELOCs. Many lenders are freezing and cutting HELOCs even for borrowers with sterling credit and big equity in their homes, says Weston Sutherland, director of product management, FeeDisclosure.com. Borrowers generally see HELOCs as an inexpensive, flexible source of cash. Lenders have opened more than $2 trillion. But if your line has been lopped, there may be steps you can take to fight back or cope with the problem. .
A HELOC HELOC Home Equity Line Of Credit is secured by your equity in the home. Recent declines in housing values have trimmed home equity in many areas. That's why lenders are reining in HELOCs. They often reserve that right in the fine print of their deal. Lets say Jack Brown applied for a HELOC in 2005. He had a $300,000 mortgage balance on a house worth $400,000. Brown's equity was the difference: $100,000. A lender might have given him a HELOC for $100,000: 100% of his home equity. Suppose that Brown now owes a $40,000 balance on his HELOC. And his mortgage balance is $295,000. So he has $335,000 in home loans. But the lender now estimates that homes in Brown's area have fallen by 20% since 2005. In that case, the lender projects that Brown's home would be worth $320,000. That wipes out Brown's equity. On paper the lender would not be secured for all of the outstanding debt on the HELOC and there would not be enough collateral to justify further borrowing by Brown. The lender might send Brown a letter saying his HELOC has been frozen. If you receive such a letter, what can you do? You can accept the new limits. Maybe you simply don't need to borrow money. That could cost less than dipping into a HELOC. Their rates currently average about 6%. If you don't have enough cash, you can appeal some HELOC freezes. Call the lender's customer service department and ask if it has an appeals procedure. "You generally will need to demonstrate that the value of your home hasn't declined or hasn't fallen by much," said Keith Gumbinger, vice president. to thaw your frozen line of credit. Bogris Appraisal LLC is frequently appointed in probate and condemnation proceedings and also used by banks and real estate concerns to determine the market value of properties like yours. Bogris Appraisal LLC offers competitive fees comeasurate with the assignment. The appraisal may help your frozen HELOC to thaw. Suppose Janice Green has a house she bought years ago. Her mortgage balance is $350,000. Say Green also has a $100,000 HELOC. She has not borrowed against it, but all of it was frozen. Green might get an appraisal showing her house is worth $500,000. So she'd have $150,000 in home equity. On the strength of that, her lender might restore her $100,000 HELOC. Or it might make, say, $50,000 of that line available to her. Bottom line: People who bought homes at the peak of the market may face stiff challenges. Many owners now find the ratio of their home loans plus HELOCs vs. home value has soared. If your home is leveraged over 80%, you likely will find it hard to get more home equity debt. The situation is better if you bought your house before the market peak. You may have ample home equity. If you have solid credit and reliable income, you can borrow against your house. "This is a good time to shop for home loans," McBride said. If you're qualified, you can get attractive terms for a HELOC, no matter what some lenders might tell you. Is there a free lunch out there? Is an FHA insured loan right for you? Although rates rise Affordability continues to rise. DO FORECLOSURE SALES AFFECT THE REAL MARKET VALUE ? How To Thaw A Frozen Line Of Credit, Bogris Appraisal has helped homeowners like you free up frozen credit lines. BPOS DOES ANYBODY THINK CHEAPER IS BETTER?